A men's lined leather jacket can keep you warm while looking cool at the same time. It can be worn for numerous occasions and looks great with just about anything. Lined jackets come in a range of styles such as aviator, blazer, motorcycle, zip front, hooded and trench. Many jackets come with removable liners that can either be attached with zippers or buttons. This gives men two jacket options in one style. A men's lined leather jacket can be worn for activities such as ice skating, watching a football game, cool night out or for a winter afternoon date. Wear one anytime a leather jacket would be appropriate. 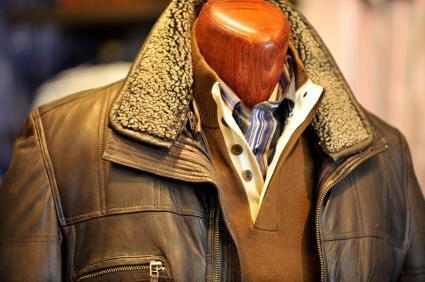 Many men's stores as well as department stores carry a wide selection of leather jackets. Shop during fall and winter to find them at retail locations. They can be found year-round on a variety of websites as well. Leather Aviator Jacket is done in brown distressed leather. It has a removable lamb shearling collar and is lined with polyester. It is both warm and comfortable and will be a staple in any man's winter wardrobe. Heritage Bomber Jacket comes in either honey or brown. It's a longer length lined with goose down, making it very warm and cozy. L.L.Bean features the Flying Tiger Jacket that is lined in merino wool and polyester. The sleeves are lined with Thinsulate. This jacket comes in either dark brown or weathered leather, and since it is made from goatskin will stay soft in the coldest of temperatures. At Macy's, men can find styles of lined leather jackets such as the Marc New York Rex Coat done with a removable shearling collar. This jacket has a quilted lining made from a blend of nylon and acetate. It is accented by tonal stitching and side pockets. Shepler's sells the Cripple Creek Sherpa Suede Leather Jacket. It is made from super soft cognac leather and is lined with warm sherpa. This jacket is done in a classic jean jacket style that has tonal multi-row stitching and adjustable waistband tabs. Men's lined leather jackets are not always the best choice for occasions that require dressier attire. They are not appropriate for professional settings or business meetings. They do look great for casual events or for laid-back afternoons when you want something edgier than a basic winter coat. Leather jackets do require special care in order to keep them looking their best season after season. Always get your leather jacket cleaned professionally and have it treated with water and stain protectant. If you get a stain on your jacket, spot clean it with a mild soap and water. After wearing your jacket in rain or snow, allow it to dry completely before storing it your closet. By caring for your jacket properly, you will be able to enjoy it for years.